The traction which these basketball shoes offer is excellent for quick change of direction on the court during a game or when training. The hex pods on the outsoles have unique bars and sufficient grooves, allowing for fast multi-direction switches and movement on both clean as well as on somewhat dusty courts. So, even though the outsoles of these shoes might look a bit weird they are definitely designed to provide the best traction for a better and safer performance. 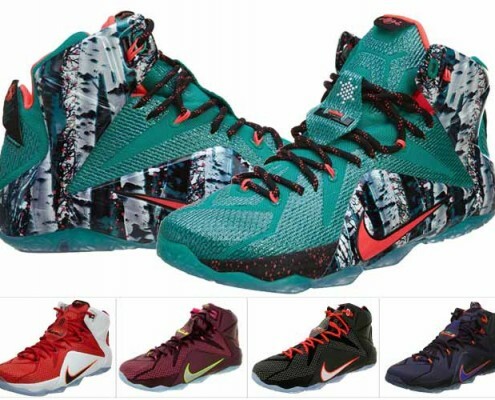 The cushioning provided by the Le Bron 13 shoes has definitely stepped up as compared to the preceding 12 model. The forefoot features four smaller Nike Zoom Air units, which along with the two 13mm Zoom units in the heel provides for better responsiveness, a smoother heel-to-toe transition, and a lighter feel. The wide base of these shoes cradles the feet comfortably and adds to the feeling of stability and provided support while playing or training. The improved support is also due to the zero-stretch materials in the uppers, which help keep the feet and ankles stable and in place. Still, the shoes offer sufficient mobility and flex so that the support doesn’t harm the overall performance on the court. The one piece upper offers a perfect fit and support, and yet does have the necessary flexibility in just the right places to ensure that your performance is not affected. The zero stretch TPU and Fuse in certain zones which help keep the foot in position when quickly changing directions on the court. The other layers are very lightweight mesh and Posite to keep the mesh intact. The materials used in the upper will be fully appreciated once you try these shoes in action on the basketball court. These shoes fit true to their size, but again the fit is strictly individual, so it is recommended you try them on before buying them. This is especially true for those who have high arches, because of the zero stretch of the Fuse and Posite materials used above the midfoot. They do need some breaking-in and warming up before a game, but after that they will provide you with the best fit and improved performance.